It is important to hire a carpet cleaner in Harlan one time each year. Your carpet needs deep cleaning to remove embedded dirt and soils beneath the surface. The deeper dirt does the most damage to the carpet fibers. Hiring a Harlan carpet cleaning company to remove the deeper dirt restores the color and quality of your carpet for the upcoming year. Professional services help extend the lifetime of the carpet too. There are a few things to consider before you choose a Harlan carpet cleaner. You should research the company online to learn their process and read reviews from previous customers. You should talk to friends, family members or neighbors too to see what company they recommend. You don’t want to hire the wrong carpet cleaning service. Damage to carpet can occur. Your home can also be subjected to toxins and chemicals and there are several common carpet cleaning scams to be aware of too. Your best choice for carpet cleaning in Harlan, IN is Chem-Dry of Fort Wayne. We have years of experience serving residents and businesses throughout Allen County with a safe and healthy service that provides superior results. We use The Natural®, a green-certified cleaning solution that creates millions of tiny bubbles, to lift deeper dirt and bacteria. Then our Hot Carbonating Extraction (HCE) equipment eradicates the dirt and germs from your home. The entire process is recommended by carpet manufacturers and has received The Carpet & Rug Institute Seal of Approval. You can trust your carpet in the hands of our trained technicians. The entire process is efficient and effective. We clean the carpet in 1-2 hours and then it is dry 1-2 hours after that. You don’t have to wait hours and hours or days for carpet to dry when you hire Chem-Dry of Fort Wayne. 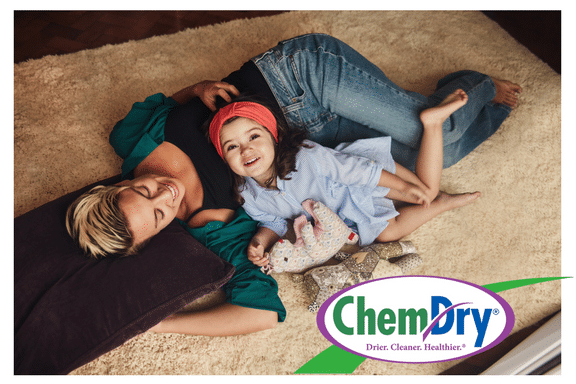 You can schedule upholstery cleaning during your carpet cleaning appointment from Chem-Dry of Fort Wayne. The service we use to clean furniture is very similar to our carpet cleaning process. We vacuum the furniture and cushions. Then we spray The Natural® onto the upholstery and cushions of sofas, couches, dining room chairs and more. We clean car interiors too! We then use powerful handheld suction equipment to extract the soils and our solution from your furniture. The process removes dirt, bacteria and over 98% of allergens from your upholstery. Don’t forget about your area rugs! Your rugs need routine cleaning the same as your carpet does. You might want to schedule rug cleaning in Harlan even more often since most rugs are placed in high-traffic areas in a home. Your rugs receive a lot of wear and tear every single day. Our rug cleaning process is perfect for kitchen rugs, bathroom rugs, area rugs, rug runners, stair runners, heirloom rugs and Oriental rugs. We provide the proper care and gentle cleaning to remove dirt from fine textiles without damage.